This PDF 1.7 document has been generated by PDFium / Adobe Acrobat Pro DC 15 Paper Capture Plug-in, and has been sent on pdf-archive.com on 30/10/2017 at 15:53, from IP address 128.255.x.x. The current document download page has been viewed 321 times. 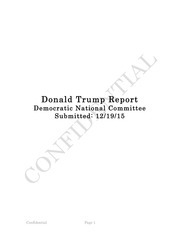 File size: 428 KB (14 pages). Russia's efforts. The FBI opened and coordinated the investigation in Washington, D.C.
PAPADOPOULOS had been a foreign policy adviser to the Campaign for over a month. 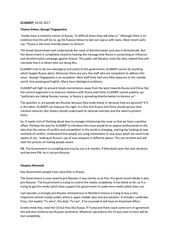 the Campaign and Russian government officials. 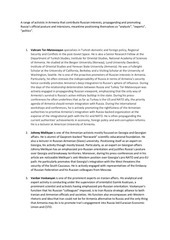 understood that a principal foreign policy focus of the Campaign was an improved U.S.
PAP ADO POULOS met an individual who was a professor based in London (the &quot;Professor&quot;). PAPADOPOULOS thought could increase his importance as a policy advisor to the Campaign. 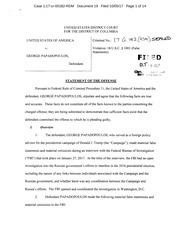 defendant PAPADOPOULOS was one of five named foreign policy advisors for the Campaign. President Vladimir Putin with connections to senior Russian government officials. in London, they never did. between then-candidate Trump and President Putin. 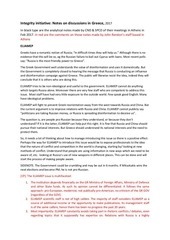 Russian government, and took steps to advise the Campaign of his progress. a &quot;potential&quot; meeting between the Campaign and Russian government officials. interviewed by agents from the FBI. This file has been shared by a user of PDF Archive. Document ID: 00691113.